Oh, just thinking about the holiday season gives me all the feels. From gathering around the table with family and friends at Thanksgiving to dancing around to the hubby’s Christmas playlist, I look forward to this time of year. But with all that excitement, there might be a little Grinch hidden behind all your joy. That lingering feeling is stress. From celebrating birthdays, school performances, end of the semester, playoffs, parties and traveling, our days and nights through the holiday season is quite full. We are planning for work parties, Christmas shopping, and spending time with family and friends. Let’s not talk about the budget. That’s an entirely different conversation. Needless to say, it’s not uncommon for couples to experience stress or even a disconnect during the holiday seasons. Oh, it can be quite easy for us to give our marriages what is left over. 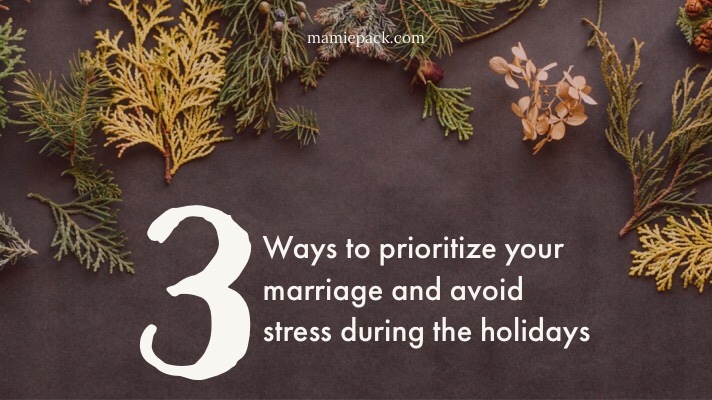 That’s why today, I’m sharing three tips to prioritize your marriage so you can avoid stress during the holidays. Okay, every year I have the whole list in my head of all the activities and memories I want my family to experience during the holiday season. I count down until it’s time to decorate, cook cookies, and drive around in our pjs. But what I want us to do versus what my hubby wants to do may not always be the same thing. Then what should have been a merry time has me feeling some kinda way. Stress during the holidays easily happens when we are just trying to do too much, and we fail to communicate our expectations. This season simplify. As a couple, sit down to discuss the traditions and activities that matter to your family. List the top 5 you will do together and allow this to be your focus. Anything extra is a bonus. Whether you are parents or professions, it’s easy to let life get in the way of prioritizing your marriage, especially during the holiday season. But creating quality time together is quite simple when we are intentional. Even if it is for 30 minutes, stop doing for others and start doing for each other. Cook a meal together. Go for a walk. Play a game. Whatever you do, take the time to reconnect. Your stress levels will be lower, and your communication can increase. Setting time aside to reflect on your needs as an individual and as a couple will help you prioritize marriage during one of the busiest times of the year. Even before the holiday season begins, start to reflect on previous seasons. So how do you do that? First, identify the good moments. What works well for you? : Self awareness helps during busy seasons like the holidays. Do you need time to decompress after a long day of family activities? If so, talk about that ahead of time with your spouse. Do you need to be social, experiencing local events? Communicating your needs with each other will make for enjoyable family time. What works well for your marriage during the holiday season? : Think back to the good moments from your holiday time together. What makes you smile? Is it cuddle time on the couch with a movie and hot chocolate? Or is it getting outside and playing in the snow? Whatever it is that creates the good moments, be sure to create more opportunities for them to exist. Prioritize these moments in the midst of planning your schedules. When does the conflict occur? : Conflict in marriages during the holiday season can have a trend. Maybe its all the noise in the car with the kids during an 8 hour trip to your in-laws. Or do you get stressed when you have company for several days? Or did you feel out of place at your spouse’s work party? Knowing when the conflicts usually occur will help you to identify what triggers the issues in your marriage. What is the conflict? : Okay, this one can get a little deep. We like to think the conflict is situational, but often it’s not. Conflicts are usually flares of deeper issues of insecurity, fear, abandonment, etc. Knowing the root of the issue prevents a lot of problems and hours spent talking about the same think over and over again. How can you respond when you feel triggered? : Talking together about how to respond in good moments, will help when you are walking through the challenging ones. In the good moments, you can talk about what steps you will take when one of you feels stressed, tired, or misunderstood. Discussing this ahead of time will help set you up for success. Knowing what works well for you will help with the conflicts arise. When did conflict or stress occur? Was it when you visited your in-laws or when company came for a visit? Maybe you felt unseen at your spouse’s work party? Remember the heart behind the holiday season. Choose to squash those stressful moments and prioritize your marriage. Create memories you both will enjoy for years to come. Sending Happy Thanksgiving, Merry Christmas, and Happy New Year feels to you all! You are talking directly to me! I already have a list and schedule in my phone of Christmas activities for my family. I need to discuss with and consider my husband with all my plans. Thanks! Oh, yes Amanda talk over the details with your hubby. He may have some cool places to visit too! Oh, thanks! I appreciate you stopping by. I love this post! ” Then what should have been a merry time has me feeling some kinda way.”- YES. SO. MUCH. My husband and I go rounds near Christmas. We had to simplify big time a few years ago and now we will not go annnnywhere on Christmas Day. Great post! It is wild how we can get so caught up in conflict during a time we should be coming together. Definitely time for no more drama! Usually stress comes from things we can’t control too much of. For example, cooking Thanksgiving food all day on our own, or having to clean for guests, etc. I am fortunate that we don’t have too much drama or really argue, but unfortunate that most of it is out of our control. we do pretty well stress wise around the holidays as is, but will our move, it’ll actually be less-stressful. no guests! It took us a few years to figure this out. We had to minimize what we were going to do with family and make our own expectations. That is so good Rachel! Talking about those expectations help out your relationship a lot. It makes me so sad that the Holiday’s can be stressful for people. It should be a time of Joy! Oh, I agree with you Chelsea. This season should definitely be a time of joy. What do you do to keep the focus on the joy of the season and not get stressed out? These are great tips, Mamie! My hubby and I both get a little stressed when we’re out of our routines, so holidays or any kind of get-together can trigger us. I’ll definitely have your list in mind this week and Christmas! God bless! Yay!!! Praying for a peaceful, non stressful holiday season for you all.